here we have a whole list of mouth watering products available, from the sophisticated gift wrapped boxes holding our signature collection, a variety of specialised chocolate figures for that important person in your life, or why not add a little of your own magic by personalising an item for that extra bit of awhhhhhhhh. We also have lots of treats made with your favourite combinations and ones you may not have even heard of before. Here you will discover our range of boxes, for that little treat we have our six box to the super indulgent 48 box, now we understand that picking them is half the fun........ well maybe a quarter of the fun, most of the fun comes from eating them all, so to make sure that you pick the truffles that are perfect for your pallet you can tell us exactly which ones you want and how many of them you want. Each box comes with a handy little menu card so, if you forgot what you picked...... don't worry we have it under control, or you could do what i do and cover your eyes and dive right in. There is free postage and gift wrapping with orders over £25.00 and we aim to get them into your mouth within 2 working days. We have a whole range of moulds for the cat lover, mans best friend, the football enthusiast, the shopaholic we even have a life size chocolate barak obarma.......... only joking, but we are looking! If you have something special in mind, look no further on certain item we can personalise for those special occasions for the one you love, personalisation is free of charge when you spend over £25.00 on anything in the store. All you have to do is complete the form provided when you pop it into the basket and type away anything you want, do be careful as some items can only fit a certain amount, too many and it may look messy, theres a handy guide to each product in the description that tells you the optimum characters on the personalised items. Look what we have got in store for you, inside here you will find a whole plethora of fantastic creations from treats that we all know and love like chocolate covered honeycomb pieces and dipped marshmallows and fudge right down to the things you might have never tried before like our chocolate covered stem ginger and cocoa nib. Our customers love the shards, broken pieces of white, dark and milk chocolate sprinkled with raspberries, hazelnuts or peppermint. make sure you read the description to see if they are suitable for you, everything we sell is gluten free and if you're vegan, have no fear we have a whole range just for you. 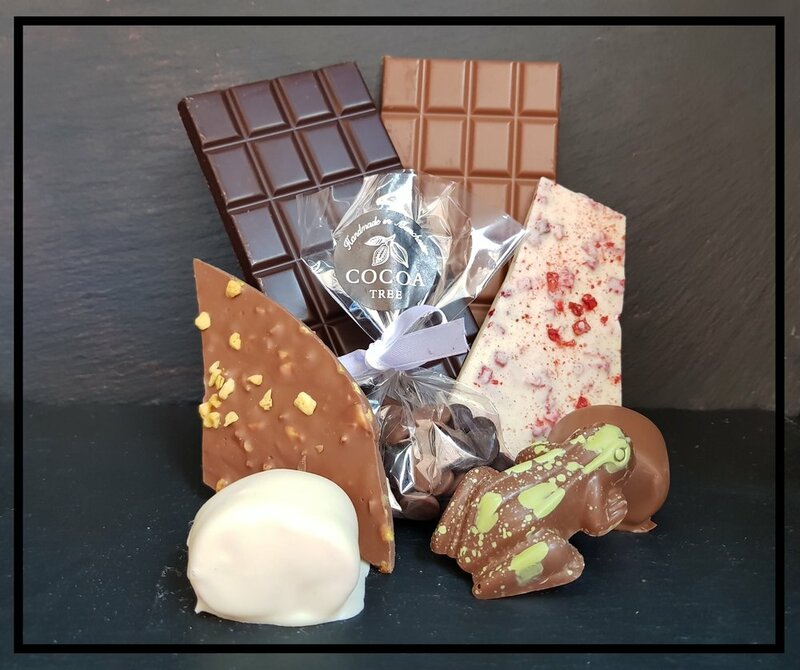 We are always coming up with new flavours and combinations, any excuse to eat loads of chocolate.......... so we do try to keep everyone updated, why not connect us to your social media accounts and we can let you know whats coming out, its a great idea to check in on the holidays, thats when we are the busiest trying new things out. you've got to be quick as the special items are of limited stock, so you have to grab them while you can. Sign up with your email address to receive news and updates on seasonal items and limited edition items. We respect your privacy and will keep you safe, Promise.